Did Charlie Chaplin Invent the Distracted Boyfriend Meme? 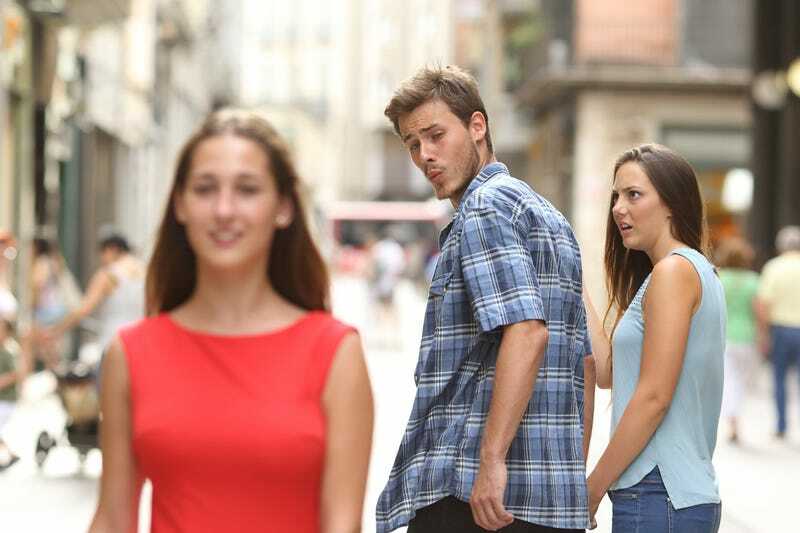 If you spend too much online, you’re probably familiar with the “distracted boyfriend” meme. It shows a man checking out a woman on the street while his partner looks on in disgust. Meme makers typically put text on each of the three characters to highlight attention being given to something unimportant at the expensive of something more valuable. The meme caught fire last year, spawning thousands of variations. But this “meme” isn’t so new. In fact, Charlie Chaplin had his own version of this bit almost a century ago. Charlie Chaplin’s 1922 short film “Pay Day” tells the story of a working guy (his familiar Tramp character) who can’t get a break. He works hard to make money, but it always seems to vanish, especially when he goes home to his wife. There’s one scene in the film where Chaplin is leaving work but his wife is following him, waiting to get some money. But Chaplin has no idea she’s behind him. Film writer Peter Goldberg posted an image of the scene to Twitter over the weekend, showing Chaplin’s wife catching him looking at another woman on the street. It’s nearly identical to the distracted boyfriend meme. One person reversed the image horizontally to make it more in-line with the newer meme from the 21st century—but that’s not entirely necessary. Reversed or not, the discovery of the Chaplin version of the meme seems to be breathing new life into the format. People are already making new jokes about silent movies and the invention of the automobile, which work perfectly. You can watch the entire film on YouTube if you’re so inclined. 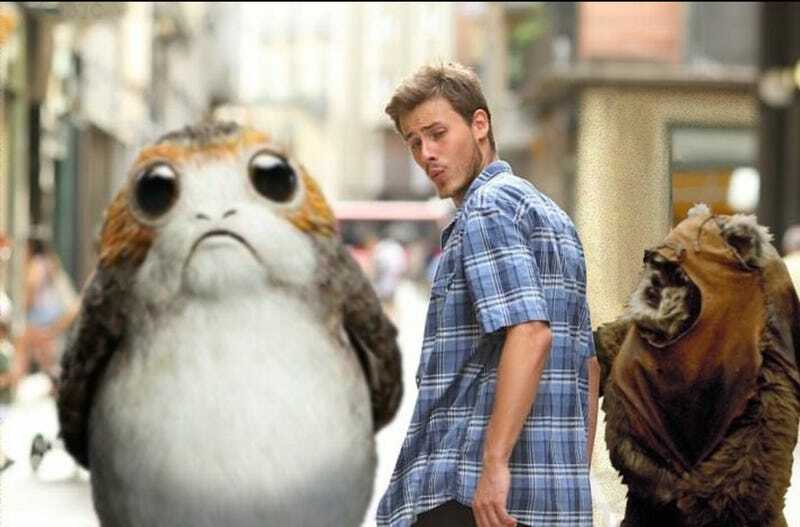 But never forget the best version of this meme—the Ewok/Porg version. It’s really hard to beat.